Blackheads is probably one of the most common beauty problem. Blackheads are bad because there seems to be no permanent cures. One can take precautions and follow regular blackhead removal procedures to keep blackheads at bay. 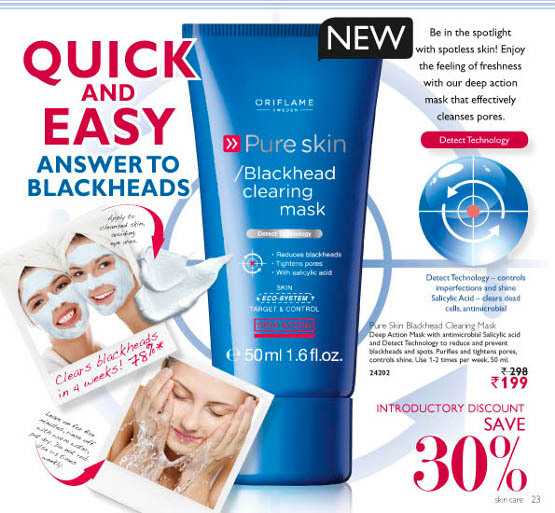 Oriflame Pure Skin Blackhead Clearing Mask is one such product. This mask has a deep cleansing action that can prevent blackheads from reappearing. It should tighten the skin pores thereby reducing sebum secretion. The new Oriflame Blackhead Clearing Mask works by controlling skin imperfections and shine. It is rich with the natural goodness of antimicrobial salicylic acid to clear the layer of dead skin cells. It also purifies and tightens pores for a clear and flawless texture. The clearing mask should be used 1-2 times a week to get visible results in just 4 weeks. Apply on cleansed skin avoiding the eye area, and leave for 5 minutes. Rinse off with warm water and pat dry for a breathable and healthy looking skin. Oriflame Pure Skin Blackhead Clearing Mask (50 ml.) is priced at Rs. 298/- Currently there is a discount of 30% of this face mask. So the price in till discount is on is Rs 199. Hi, I like this product but i would like to confirm that,is this product useful for men ?